The Australian 'prisoner rights' movement had grown considerably during the 1970s. There had been prison disturbances around Australia at places such as Bathurst in 1970 and 1974, resulting in the Nagle Royal Commission. 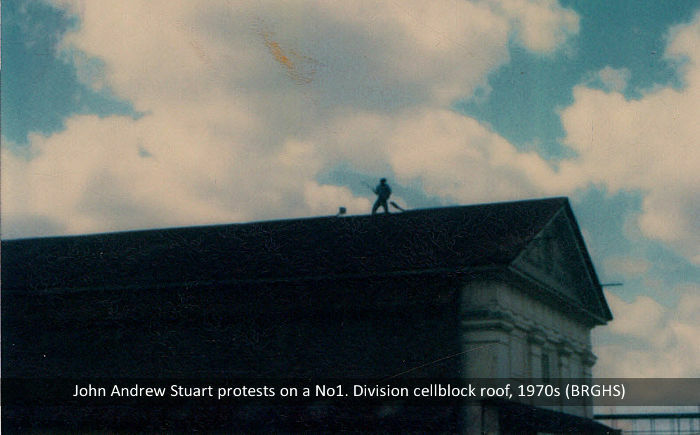 There was also plenty of trouble at Boggo Road during that decade, including the famous protests of John Andrew Stuart. There was a stand-off in 1970 when 60 prisoners went on strike in a yard, refusing to return to their cells after it was announced their would be no remissions (time off their sentences) to mark a Royal visit (as was traditional). In 1971 there was a five-hour riot that started with 33 inmates in G Wing, No.1 Division, protesting for improved food and conditions. The protest was broken up with the use of tear gas. 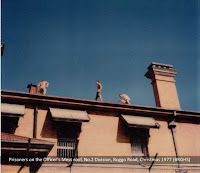 Boggo Road inmates rioted in May 1974 after they were locked in their cells during an officer's strike, starting fires and destroying wooden furniture on their cells. In September of that year, after days of violence, prisoners threatened to burn down the prison 'like at Bathurst'. Extra armed guards were stationed around the prison and more than 100 inmates were locked in their cells as a security measure. 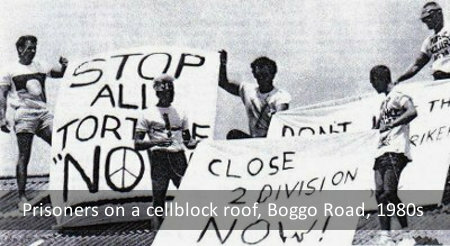 Although there had been numerous incidents of hunger strikes, riots and staff strikes at Boggo Road over the decades, the 1980s proved to be the most turbulent years in the history of the prison. 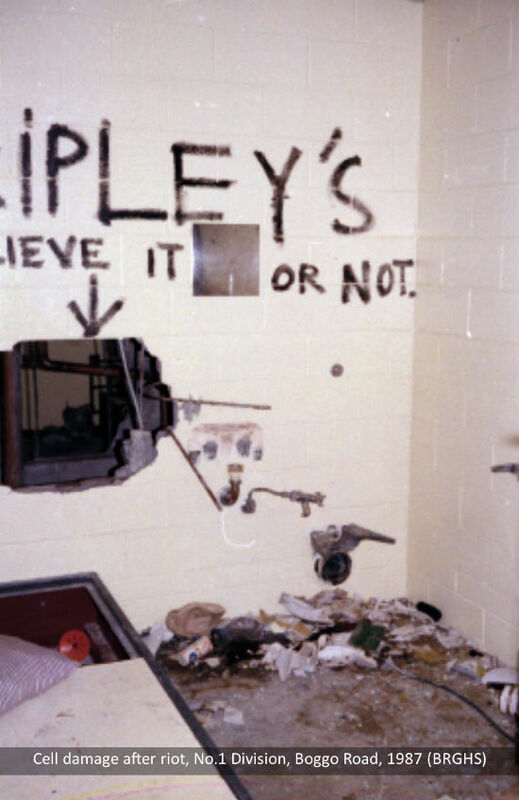 Riots, mass escapes, hunger strikes, drugs, rooftop protests, staff strikes, murders, suicides and bashings became a regular part of the news cycle as the prison became an increasing embarrassment to the Queensland government. The 1988 'Kennedy Report' into prisons brought about the demise of Boggo Road, much to the delight of prisoner advocates and the disgust of the staff. In his report, Kennedy referred to the 'new breed of prisoner - which I would call the desperadoes'. No.2 Division closed in November 1989, No.1 Division in 1992. The 1980s proved to be a particularly turbulent decade for prisoner unrest at Boggo Road, often backed up by political agitation outside the prison from organisations such as radio station 4ZZZ, and although much of the trouble was centred in No.1 Division, it sometimes spread throughout the whole complex. Prison officers went on strike for better working conditions. 100 police and a few non-strikers staffed the prison for just over a week. A mass hunger strike took place as prisoners complained about inadequate food and 'harsh conditions'. This escalated into a riot after Welfare Minister stated that the strikers should be left to starve, and the prisoners took over the Industrial Division for 24 hours. One third of the prison, including 129 cells, were left in ruins and uninhabitable for six months. An internal prisons report acknowledged that No.2 Division did not comply with the United Nations minimum standards for prisons. Six months after another hunger strike took place, there was a major riot in No.2 Division when prisoners lit fires, with six of them mounting the roof of F Wing to draw attention to their allegations of brutality and arbitrary discipline. They surrendered after midnight when tear gas was fired onto the roof. All three cellblocks suffered significant damage, costing around $400,000. Demonstrations of support for the inmates took place outside on Annerley Road for some time afterwards. Sensational but ultimately unsubstantiated allegations were made that militant Aboriginal prisoners intended to smuggle rifles into Boggo Road and take over the prison at the start of World Expo '88 (held in Brisbane). 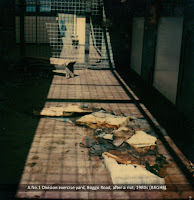 Several prisoners were subsequently locked in the then-disused 'black holes' (not the original 1883 punishment cells) - a decision described as 'abhorrent and barbaric' by the Human Rights Commission - and in response 200 prisoners rioted in No.1 and No.2 Divisions. 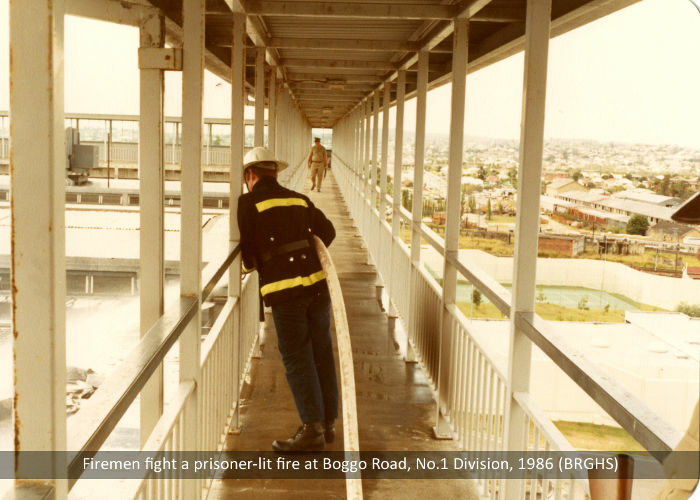 In a continuation of the troubles sparked a few months earlier, five prisoners mounted the roof of F Wing in a week-long protest to call for the closure of No.2 Division. They painted demands for justice and a public inquiry on the roof before beginning a hunger strike. The exhausted men were eventually taken down off the roof with the aid of a fire engine. 350 prison officers went on strike after a near riot. Police erected barricades around No.2 Division, which was subsequently staffed by 35 police officers and a Tactical Response Squad. P N Grabosky, 'The abuse of prisoners in New South Wales 1943-76’, Wayward governance: illegality and its control in the public sector (Canberra: Australian Institute of Criminology, 1989). Stephen M Gage, Boggo Road: Riots to Ruin (Victoria: Sid Hartha Publications, 2009).